This is the least expensive root beer purchased thus far. The Shasta Root Beer Review was conducted from a 2.5 liter bottle at a cost of $1.00. Shasta is another one of those ‘generic’ root beers. This was purchased at a Dollar Tree store. 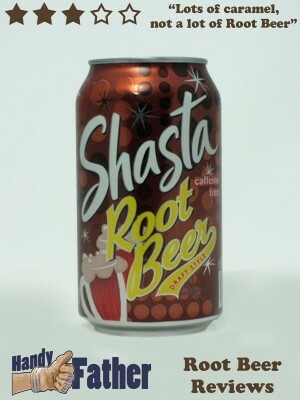 Shasta root beer has a strong caramel flavor, and that overwhelms any other root beer flavors in the soda. Very sweet, highly carbonated and lacking in character, but it isn’t a bad taste overall. Shasta is available in cans and larger plastic bottles, and is apparently fairly popular in the west. If I get to do any traveling, I’ll give it another try in another region. We gave the Shasta root beer review a score of 3.0 out of 5. It was middle-of-the-road in color, its frothy head, and flavor. Not a bad option for cheap root beer, but pass on by if you’re looking for a root beer of substance. Ingredients: carbonated water, high fructose corn syrup, caramel color, natural and artificial flavor, potassium benzoate.